This is the next stage of an on-going watercolor lesson. At this stage I am going back to check the entire painting for value ranges. 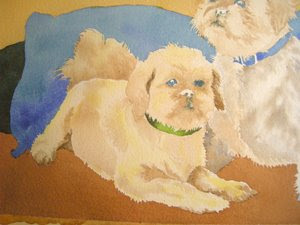 I want the strongest values changes, the most color, and the most detail around the dogs faces, which is my focal area. I used VanDyke Brown to develop the darker shadows around the ears, mouth and eyes. I also used Burnt Sienna to develop the mid range values around the face and in the shadow areas of the legs and tails.